This course collection has everything necessary to become a real Pyro! 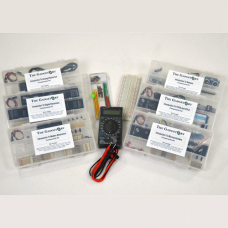 It includes, 6 components kits (covering the Modern, Digital, Analog, Microcontrollers, FPGA and Sensors topics), an 11 Function digital multimeter and an 830 point breadboard. This is really everything you need to get started learning about how electronics works and building your own circuits, so what are you waiting for?…get started! 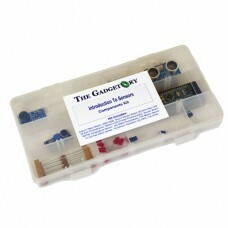 Introduction to Sensors Kits Now Available! It’s a brand new year and we’re ready to bring some awesome new kits to you. PyroEDU’s An Introduction To Sensors free online course is starting at the end of April and the complete kit & components kit for the course are available now! 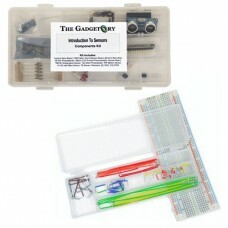 The components kit for the Introduction to Sensors course includes all of the components used in the course and the complete kit includes an 830 point breadboard, a jumper wire kit with many different colors and lengths of breadboard jumper wire and the sensors components kit. We will also be adding the Introduction To Sensors course DVD at the conclusion of the course in June 2015. So if you prefer to follow the lessons in your home using a dvd player and TV, stay tuned, we’ll have exactly what you want very soon!